Despite political differences, the Kremlin and the White House share an affinity for exclusive limousines, writes Tom O'Connor in his article for the American media Newsweek. The journalist compared the limousines of Russian and US leaders, Vladimir Putin and Donald Trump, respectively. Aurus is the name given to the Russian brand of cars that will include the presidential limousine, a sedan, an SUV and a minivan. The name is a combination of the word 'aurum' ('gold' in Latin) and Russia. On the other hand, the limousine of the US president is called 'Beast' for its high level of shielding, although already in the process of retirement. Last week Vladimir Putin was again elected president of Russia for the fourth time. The Russian president took the opportunity to release a new Russian-made limousine, but with support from Western manufacturers such as Bosch and Porsche. This new limousine will allow retiring the Mercedes S600 that the Russian leaders used until now. Despite its Russian DNA as it aims to be a showcase of what can develop the national automotive industry - a more basic version could be marketed later for a price that would be around 125,000 dollars, international media suggest that it uses a V12 engine Porsche origin and technology of the German house Bosch. Despite its spectacular appearance, the limousine of the Russian president started off on the wrong foot. "The vehicle had to suffer a mishap because it was removed to a place at the back of the Kremlin park and Putin then got on his Mercedes," said ABC correspondent Rafael Mañueco, in his chronicle about the event. The vehicle reaches almost seven meters in length, which makes it the longest presidential limousine in the world, and exceeds five tons in weight, with a 12V engine of 6.6 liters and 860 horses, and has high measures of security, so it will not integrate systems of the popular 'smartphones'. In this way it is intended to avoid the risk of possible data leakage when connecting the telephone to the car. The new Russian presidential vehicle, of the Aurus brand, is part of the Kortezh (Courtship) project, launched in 2012. Its objective is to equip the Russian high officials with an official car, manufactured in Spain, but also with the "conquer the global automotive market”. In addition to the limousine, the project includes a model sedan business, a minivan and an SUV (for bodyguards). On the other hand, Trump inherited his flagship vehicle, known as The Beast from his predecessor, President Barack Obama. This limousine licensed by General Motors was built with the help of the US Secret Service. "It's like a golf cart with the frame of a tank." This is how the former US president, Barack Obama, defined his fleet of limousines, which premiered on January 20, 2009, and which are now one step away from scrapping. 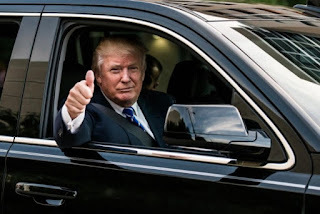 According to the North American Fox network, Obama's successor, Donald Trump will receive a new fleet of vehicles for transport later this summer. It will be formed by a dozen limousines developed by Cadillac, belonging to the manufacturer General Motors. Until it arrives, the current presidential car is nicknamed "the Beast" because of its enormous protective barriers, which make it an authentic armored vehicle, although its official name is Cadillac One. The limousine is armored to protect the president from any type of attack, even against one with chemical weapons. The current one combines the aesthetics of a Cadillac limousine with the structure of a GMC truck, and its unit cost is around one million dollars. For security reasons, its specifications are confidential, but that is exactly what this impressive car has to spare, even against chemical attacks. It is fully equipped with military-style armor of 12.7 centimeters thick and tires immune to punctures. It has capacity for seven people and the front part is divided from the back by a glass. The seats are black and reclining individually. Even in an emergency situation, the car can be sealed completely allowing only the secret service to open it. In addition, a thick reinforced steel plate protects the underside of a hypothetical anti-tank mine. Besides, it also has defensive capacity, thanks to gas cannons, weapons and night vision cameras. To provide medical assistance to the president, it includes a first aid kit, oxygen and blood bags of your blood group. To move all this weight, it incorporates under the hood a powerful V8 engine with an average consumption of 30 liters of gasoline. The new vehicle that will replace it, of which only some spy photos have been filtered, will combine aesthetic elements of the Escalade SUV and the CT6 sedan. According to the aforementioned source, the White House would have paid more than 15 million dollars for the development and construction of the vehicles, so the cost per unit would far exceed 1.2 million euros.